What is Zentel (Albendazole IP) used for? 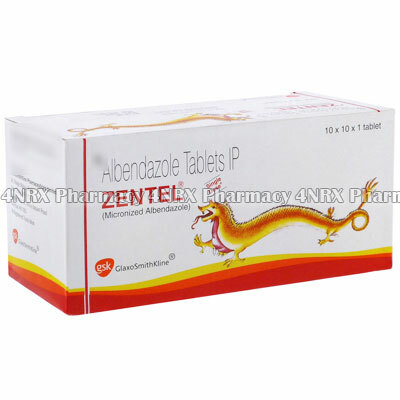 Zentel (Albendazole IP) is a type of anthelmintic (anti-worm) medication which is used to treat infections caused by pork tapeworm, such as neurocysticercosis. The medication stops the newly hatched larvae from growing and multiplying in the body or kill a tapeworm infection allowing them to be excreted. How should I use Zentel (Albendazole IP)? Zentel (ALbendazole IP) should be used according to your physician's instructions to get the most effective results from treatment. The typical dosage is one tablet administered once or twice daily for a cycle of medication lasting up to two weeks. These should be swallowed with a large glass of water along with a meal to prevent nausea. Do not split or crush the tablets prior to use to avoid destroying or altering the effects of their contents. Never stop using the medicine before being told to do so, even if your symptoms seem to have disappeared, as the infection may not be gone and can return stronger or more resistant to treatment. What are the side effects of Zentel (Albendazole IP)? Serious side effects that may require emergency medical attention are sensitive skin, easier bruising, fever, flu symptoms, or a severe skin rash. Contact your physician immediately if you experience any worrying or intense symptoms to make sure any necessary adjustments are made to your application frequency or dosage to prevent further health complications from occurring. Do not begin using Zentel (Albendazole IP) if you are allergic to albendazole or have had a bad reaction to similar treatments in the past. Also inform your physician if you have liver disease or abnormal liver function results as these conditions may require special alterations to your regimen. Strictly follow all instructions provided to you by your physician or pharmacist while using Zentel (Albendazole IP). Optimum and safe dosage can differ based on the patient and the condition being treated.